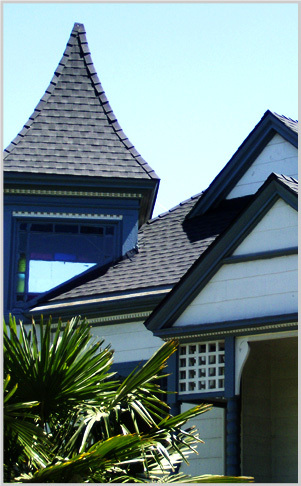 Chavez Roofing has been in business since 1992. We have established a reputation of being one of the most quality conscious companies in the East Bay roofing market. Our reputation began in the early 90's with the residential shake roof market installing. Weyerhaeuser Taper split shakes, the Cadillac of wood at the time. Along with that, we have developed the specialty of tearing off existing roofs and re-sheeting with plywood to install multiple types of composition roofing materials. Later we began a search for the ultimate, yet affordable, roofing products. We've seen many products come and go, but there are a few unique products that may surprise you, which replace the shake roof without sacrificing the look of shakes. The flat roof industry for commercial buildings has come far over the past few years and Chavez Roofing has moved into that arena of single ply membranes like IB Roof System's PVC membrane. A beautifully designed impermeable 6ft wide sheet system that has huge maintenance and UV Advantages. Our installation crews are well trained in a multitude of products and pleasant to work with on the job site. We at Chavez Roofing pledge to devote our efforts to the attainment of service excellence and do here commit to ever improving service quality by being courteous to every customer, supplier, and fellow employee; by reflecting a positive attitude at all times; by displaying a professional appearance; by exerting the extra effort to follow through; by providing prompt and accurate feedback to the customer and by continuously seeking to improve our industry knowledge. With this, our goal is to achieve 100% Customer Satisfaction.